The legislature is in full swing and they will finally begin to tackle the AB284 language debacle. For those of you that haven’t been following… AB284 made it tougher for a lien holder to foreclose due to the vague language of “personal knowledge” and other verbiage. Oh yeah… it’s also a felony if you mess it up. The bill text can be read by clicking on the picture to the right and you can watch the committee by clicking on the link below. 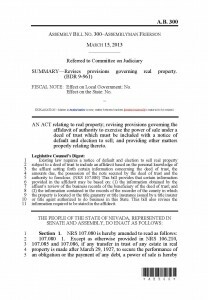 Of course, there will be future posts if this bill ends up going through and relieving the lack of inventory burden carried in today’s Reno/Sparks real estate market. For more information on buying or selling contact Broker Ricky Beach at (775) 750-1437 or Ricky@Resnv.com. Posted in For Agents, For Buyers, For Sellers, News and tagged AB 284 2013 change, ab300 nevada foreclosures ab284, legislature foreclosure law ab300, nevada reno foreclosure law changes, reno foreclosure inventory ab284, watch nevada legislature foreclosure law video. ← How Much Active Inventory Is On The Reno Market?